A ponderous, plodding shooter with levels that drag on for aeons, that champions boring conservatism over death-defying aerobics. One of the least exciting shoot-'em-ups I've ever played. For my sins I love a good old-fashioned shoot-'em-up, so I was secretly a little excited when a download code for Project Root popped up in my inbox – a game I knew little about, other than it was vaguely reminiscent of EA's old Desert Strike series. That I immediately wanted to stop playing about five seconds into the tutorial, despite the positive mindset I entered with, should speak volumes about how badly wrong Project Root gets everything. It's too slow, for starters – your plane flutters through the air with such a jarring lack of ferocity that you'd assume it was being pushed through the air by the beak of a passing pigeon. All the while enemies swarm around you in a muddled fashion, spraying bullets at you with gun turrets so tame you could give them away with copies of The Beano. There's no energy or passion to the action. If it got any more exciting, a funeral would break out. 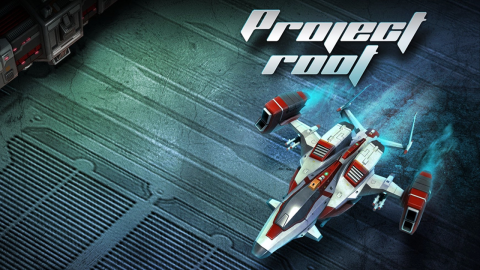 If only the lack of thrills and spills were Project Root's only problem. Any lingering potential Project Root might have held as a therapeutic time-waster are smushed underfoot by a framework designed to frustrate and annoy. Like EA's Desert Strike series (or Avalanche's Renegade Ops, if you want a more up-to-date but slightly less accurate reference), this is a multi-directional shooter taking place inside a succession of vast arenas. Within these arenas, you have to perform a succession of tasks, all chain together via a plot that completely passed me by, because the mid-mission exposition is delivered in a font so small physicists are working round the clock to work out whether they can split it. Nonetheless, they're usually along the lines of 'shoot this' or 'destroy that'. None of the sub-missions are taxing, in and of themselves, but each stage features too many of them, and there's no checkpointing, meaning that when you fail, it's usually death by a thousand cuts, as impotent crafts slowly chip away at your health bar. Such is the monotony of the action, that the realisation that you have to play through the last ten minutes of (tr)action again genuinely gives you a sinking feeling in your chest. When you feel you can finally face up to it (it took several large men with truncheons to 'persuade' me, but since you won't have an employer's encouragement backing you, you might find you won't bother), you'll realise you have to approach the stage in a different way if you're to nurse your ship to the end of the ordeal. And that doesn't mean being more aggressive, or sharpening your reflexes, oh no – it means hanging back, playing conservatively, learning exploits and isolating enemy ships and taking them out one by one. Success, then, means making the game even more boring for yourself. Between stages, Project Root has a system where you trade XP points for ship upgrades and it imposes it with an iron fist. If you don't keep on top of the upgrades, you'll find yourself gradually drowning as levels becoming increasingly impossible. It's an incredibly unrewarding set-up – instead of making your ship cooler or more fun to pilot, you're just joylessly grinding so you can keep up with the enemy Joneses. By the time you've spent all the upgrade points available (frustratingly, there isn't enough go round to max out all your ship's attributes) you're left with something approaching the kind of speed and firepower needed to star in an exciting shoot-'em-up – by but then it's far too late to repair the damage. Xbox One isn't exactly awash with shoot-'em-ups at this point in its lifespan, but even so there is little to recommend Project Root. It's slothful, tepid and utterly devoid of verve or inspiration. Description Open world, top down, dual stick, shooting action.